These snowmen nails were probably the most intricate design I have done, but shockingly took me the least amount of time to do. Both hands were completed in 45 minutes. While I own a dotting tool, these were done without one. I don't know, but I find it simpler to make my designs and lines with toothpicks. For the base coat, I used a metallic blue from Funky Fingers. Of course, the sticker has fallen off the bottom, so I can't tell you the exact color, but it's so pretty. Funky Fingers is owned by Forsythe which is the maker of all Color Club nail polish. The Funky Fingers blue is the exact same as Color Club's Lumin-Icecent from their Foiled Collection. Next it was time for the detailing. 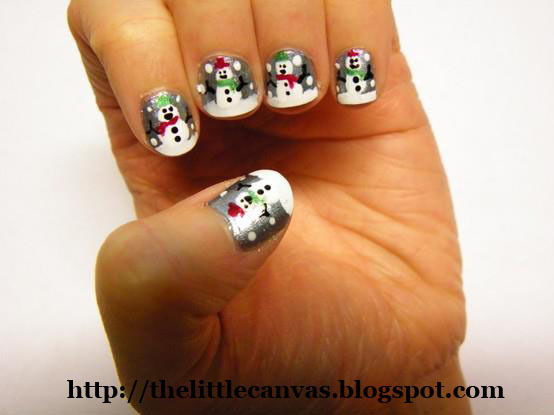 I painted the tips of my nails unevenly with white, to make it look like the snowmen were standing on a snowy surface. Then, with a toothpick, I made a larger circle and a smaller circle on top with white for the body and head. Once that dried, I took black polish and added the details of the arms, eyes, face, and buttons. Since this was done before Christmas, I made alternating red (Sinful Colors Sugar Sugar) and green (Sinful Colors HD Nails) hats and scarves for the lil guys. Loved these guys. Wish there was more snow on the ground because I'd do them again!